Red Chile Chicken and Black Bean Tacos begin with chicken, black beans, and Mexican spices in a saucy, spicy, red chile sauce. 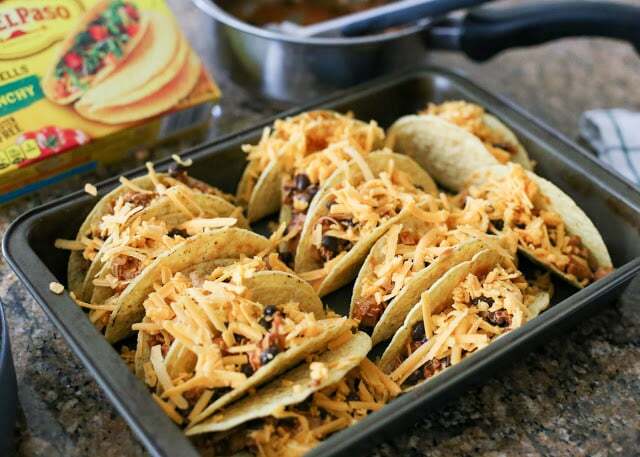 Stuffed into crunchy taco shells and topped with melting cheese, these tacos disappear almost as fast as I can make them! 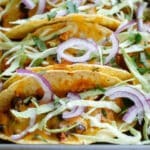 I’m partnering with Safeway today to tell you about the tacos that we’re loving these days. Red Chile Chicken and Black Bean Tacos were a kid favorite from the first bite. I’ve made these tacos a couple times already. They’re perfect for easy game day snacking or for a stress free weeknight meal. We made these tacos for lunch the first time we made them and my boys polished off the entire recipe on their own! I made them a few nights later for dinner and served them with Cilantro Lime Rice and a salad. This is a two thumbs up meal all the way around the table. Preheat the oven to 400°F. 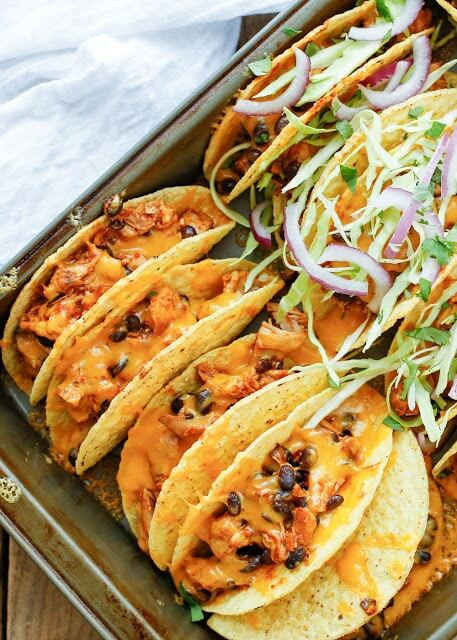 Place the taco shells in a 9x13 pan. Combine the chicken, red chile sauce, black beans, and Mexican spice mix in a large saucepan over medium-high heat. Stir frequently and heat just until the chicken is warm, about 5 minutes. Divide the filling between the taco shells. Sprinkle generously with cheese and bake again, just until the cheese has melted, about 3-5 minutes. Top each taco with the toppings of your choice. Enjoy! 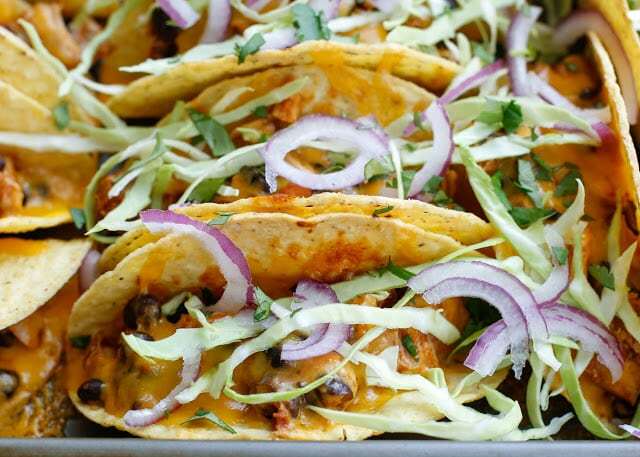 You can use a rotisserie chicken to make these tacos even simpler. Or you can cook and shred your own chicken with very little effort by using the crock-pot or pressure cooker. I picked up the ingredients used in this recipe at Safeway. Nothing beats having one of your favorite stores less than a mile from the house! Yum, these tacos sound really tasty!